When my sister and I were growing up, every few years we’d go down and visit our Dad’s family – Grandma & GrandpaN, CousinC & UncleN, and AuntJ, supported by a whole cast of other characters and cousins. It was quite the experience to journey down into the heart of the Old South. There is a vibrancy & simplicity in many areas of Eastern North Carolina. Well, so, GrandpaN used to call my sister, my younger sister by 5 years, Mud Duck. As she’d walk in the door, Grandpa would be sayin’ “well, how’s my Mud Duck”. 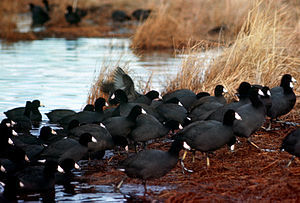 I looked it up, and Mud Duck is either a slang term for an ugly female, or a gregarious waterfowl called an American Coot. So, I’m not sure which reference GrandpaN was going for, or maybe he was being clever, and maybe he intended both. My sister is not ugly, mind you, but Grandpa liked to tease her, and he’d always get this shy smile out of her. Not too much after she was in the door, she’d be up on his knee, matching barbs at each other. He’d call her some awful thing, and she’d whip it right back at him…”yeah, well you’re a…” fill in with what ever outrageous thing a 7 or 8-year-old girl would think to call their Grandpa, then consider that this child has a mind like a steel trap, and a memory for all sorts of strange and different things. Its funny, in those 6 months living with her, we actually maybe fought 3 times. And even than, nothing like we used to. No, we just worked it out, somehow, without it turning into a screaming match. Ugh. At first it was difficult to bite my tongue, but bite it I did, and I’m glad I did. She’s a keeper, is our Mud Duck… gregarious coot that she is. A very thoughtful tribute to your sister. Well done.